We talk a lot about our lengthy note taking that is done on our iPads. Editing and presenting on the go. But, what about the little notes, the notes we have written on stickies for many years. Mostly, these notes are still little pieces of paper, which are still hard to share. Some folks have been moving successfully to using their iPhones for their quick notes. We aren’t talking about task lists, rather those little stand alone notes. On the iPhone, we have been working with an app, Drafts, since it was first introduced. The app isn’t about cute interfaces trying to mimic the physical paper world. Instead, launch the app, take a note, and move on. 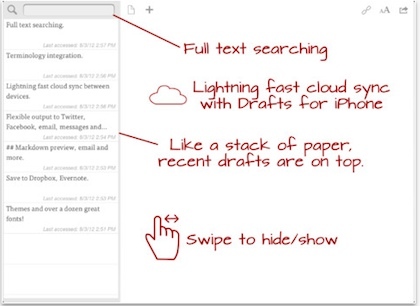 At that time, or later, return to manage the note within Drafts, send the note to another app to use the text in an expanded document, or share with others. 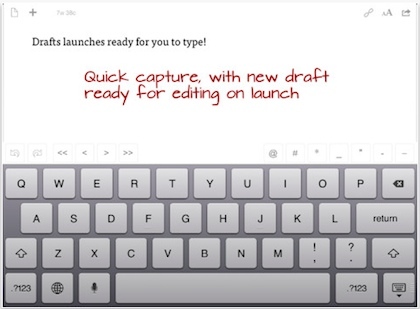 The possibilities to use the text in other apps is enhanced with Drafts ability to work with Markdown language tags. Made easier via the expanded keyboard. Drafts is now available as an app (not universal) on the iPad. Drafts isn’t for long notes, rather quick bits of text. Using hashtags makes searching faster. That is the only way to divide notes down since there are no folders or groupings for notes within the app. 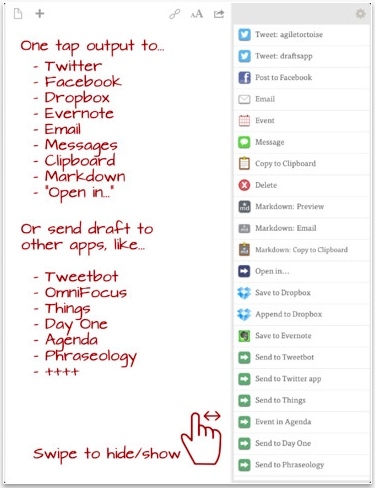 Share notes out to other apps on the iPad or to others for their use all via links within the Drafts app.